DAYTONA BEACH, Fla. (AP) — Alex Zanardi’s Rolex 24 at Daytona was problem-plagued, perhaps even forgettable. That was just fine for one of the most beloved figures in motorsports, who found the racing to be secondary to the adulation and affection he received in his return to North America. Zanardi moved to hand cycling and won that division in the New York City Marathon. The Italian qualified for two Paralympics and won six medals, four of them gold. He’s completed Iron Man competitions by using a wheelchair for the running portion and his handcycle for the biking. But he’d yet to race in North America, where he built a tremendous following during his two championship seasons in CART. He pulled off one of the greatest passes in motorsports history in the corkscrew at the Laguna Seca, California road course, and invented the victory doughnut that NASCAR drivers do to this day. It was the idea of longtime partner BMW to develop a steering wheel that would allow Zanardi to race without his prosthetics. The manufacturer assumed he’d want to use it in the 24 Hours of Le Mans, but Zanardi instead chose Daytona International Speedway. The yearlong project with BMW culminated in a reunion between Zanardi and so many of his old friends, teammates and rivals. His plotline was the richest in a race full of superstars, even if it didn’t go as planned. 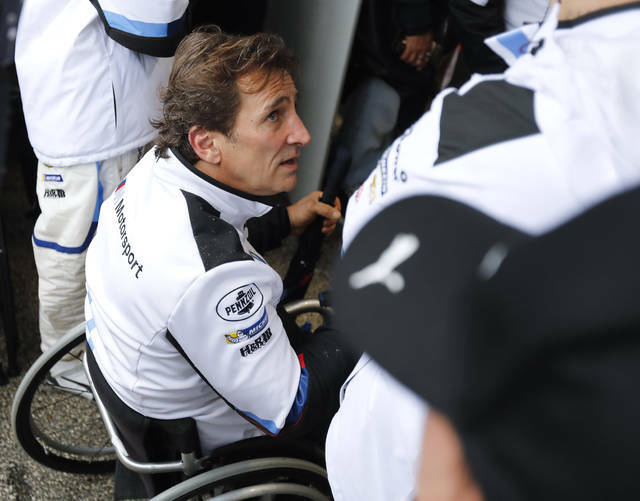 When Zanardi got in the car for his first driving stint Saturday the steering wheel that had been exhaustively tested suddenly wouldn’t make an electrical connection with the car. Neither did the backup. Zanardi nearly got out of the car before he’d even left pit lane, but one final flip of the switches at least got the wheel to connect. The problems stretched into the next driver change and put the Bobby Rahal-owned team in a hole that took it out of contention for the GT Le Mans victory. The class win went to the second Rahal car, which reinforced Zanardi’s belief that he had a team capable of winning the race. “In the end of the day, I came here because I thought it was technically possible to do what we did together, and had I not believed it possible, I don’t think I would have come,” Zanardi said. Zanardi plans to resume training in hand cycling next in a bid to defend his Paralympic medals next year in Tokyo. He turns 53 later this year. Teams spent the final third of the race complaining about treacherous conditions that had drivers concerned for their safety. The final eight hours were marred by numerous on-track incidents as IMSA waffled back and forth in its decision making. There were long yellow flag periods in which the drivers circled the sloppy track behind the pace car, the two stoppages, and many, many on-track mishaps. Richard Westbrook believed IMSA’s indecision over the weather cost Chip Ganassi Racing a third consecutive GTLM victory. Westbrook was leading and adamant it was too dangerous but IMSA picked a random time to stop the race for the second and final time. The stoppage came after Westbrook had pitted from the lead for fuel. A three-time Rolex winner and part of last year’s overall title, this race was the farewell party. The two-time IMSA champion is transitioning into a brand ambassador for Cadillac and the Action Express Racing team. “I am sad, happy, relieved, but I think most of all at peace with myself and I think that’s most important,” he said. “I went to talk to him because he nearly crashed,” Alonso said. “I was following him, and he had a massive moment of hydroplaning. Immediately after, he called red flag. I think he was a little bit scared in that moment, and when I jumped out of the car and I went to the safety car to see him, he was not there anymore. “It’s too bad we didn’t get to race the full distance, but we led the race in night, day, dry, wet, so I think we all kind of deserve this one,” he said. The Spaniard now has won the Rolex, the 24 Hours of Le Mans and the Monaco Grand Prix. The next big event on his schedule is the Indianapolis 500 in May, the one victory he needs to complete auto racing’s unofficial version of the Triple Crown. 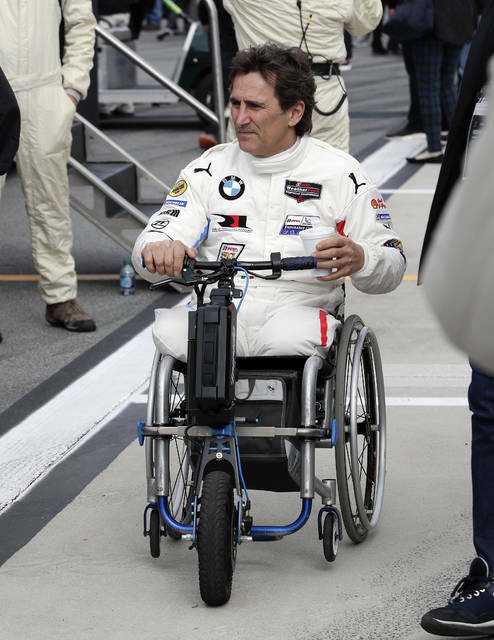 Alex Zanardi’s return to a North American race for the first time since his legs were severed in a 2001 crash was hampered by mechanical problems, including an early electrical issue with the BMW-designed steering wheel that allowed the Italian to race without his prosthetic legs. “He shows very clearly that life isn’t over and you can still go out and live and do whatever it is you want,” Rahal said. Rahal’s second BMW M8 entry won the GTLM class with Augsto Farfus, Connor De Phillippi, Phillipp Eng and Colton Herta. Alonso, meanwhile, was the heavyweight in the Wayne Taylor lineup and dazzled every time he got into the Cadillac. He competed in the Rolex last year as a warmup for Le Mans but returned this time intent on winning the Rolex watch. His first time in the rotation Saturday night was a triple stint in which he took the lead away from both of Roger Penske’s Acura entries. Alonso got the car back one final time to close out the race and took the lead when Felipe Nasr missed a turn and drove through a deep patch of water. Alonso stayed on course to move to the point, and when IMSA brought the cars to pit road minutes later under red, he walked under an umbrella to IMSA’s pace car and leaned inside the open door to discuss the conditions with the driver. Alonso then joined his teammates in the pits to await IMSA’s decision. DAYTONA BEACH, Fla. (AP) — Someone has to throw the first party of the year and IMSA has built its Rolex 24 at Daytona into a bucket-list event on a calendar full of motorsports elite races. There’s a Corvette Corral just inside the fourth turn and the Ferris wheel lifts fans 150 feet above Daytona International Speedway to watch the sportiest cars from the top manufacturers in the world. It is a festival in the infield that includes a wine-and-cheese event, a parade of historically significant cars and collectors from all over the world. Those roaring engines? One of the most prestigious sports car races in the world is the background noise for this very unique event. The twice-round-the-clock endurance race begins Saturday and Roger Penske, a week away from his induction into the NASCAR Hall of Fame, vowed to stay awake for the entire event. Penske, who turns 82 next month, pulled the all-nighter last year when he returned to sports cars with a stacked Acura program. It was apparently not a stunt because the team owner said the Team Penske pit stand has been upgraded since its inaugural race with elevated heaters to use during the brisk overnight shifts and an expanded area for the team owner to stand and stretch his legs. A stack of thermal underwear had been neatly folded and Penske said there was no reason for him to wander too far away from his DPi entries, which start second and third overall. IMSA, the series backed largely by current NASCAR chairman Jim France, is celebrating its 50th season and the Rolex has cemented itself as the place for all top drivers to begin their seasons. This is the place for drivers to prove they can master multiple disciplines and fill useful roles for teams capable of winning the biggest races in the world. Alex Zanardi, in his first North American race since he lost both his legs in a 2001 crash , is the headliner this season. “There’s only one driver in this race,” Bobby Rahal, a longtime BMW partner and owner of Zanardi’s race team, said of the attention directed to the Italian double-amputee. 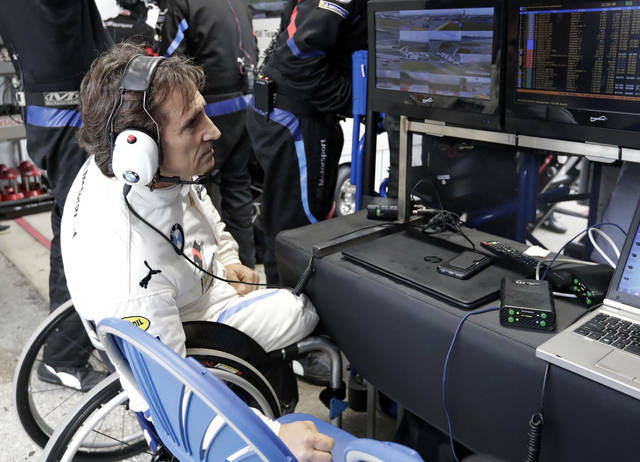 Zanardi is racing for the first time without his prosthetics by using a BMW-designed steering wheel of hand levers. His positivity and passion for life has enveloped the entire paddock, made this running of the Rolex an event packed with emotions, and created a pure excitement for the start of another long racing season. “He’s a magician,” Penske said simply. This is Fernando Alonso’s first race since he closed his Formula One career in November and Zanardi’s presence has made the Spaniard a secondary story line. Only this is the start of an action-packed year for the two-time F1 champion because he’s carving out a schedule to race events that bring him joy. So he’s booked solid into June, past the Indianapolis 500, and looking to kick this year off with a win. This is the final race of a long career for Christian Fittipaldi, one of four drivers in the Rolex field who last shared a track with Zanardi on the day he lost his legs. Fittipaldi is part of the defending race-winning Action Express Racing team and was feted this weekend with a surprise retirement party. The Brazilian openly wept as his racing career zoomed toward the finish line. Then Action Express was thrown a curveball when British driver Mike Conway failed to get out of England for what a Cadillac representative would only say was “travel issues.” Conway’s absence meant Action Express had to whittle down from four drivers to just three, the same trio that won a year ago, but Fittipaldi will have to drive more stints than planned. At least he’ll be going out with a full effort. NBC Sports is in the first year as IMSA’s television partner and pulled out all the stops for its inaugural sports car event. The Rolex is a massive kick off to a year in which NBC Sports has most of the major motorsports properties, and the network has almost all of its IndyCar and NASCAR talent lineups in Daytona. Dale Earnhardt Jr. and booth partner Steve Letarte are on site, carrying rosters, wandering the paddock, figuring out just who everyone is and what kind of car they drive. The network will also use Bell and AJ Allmendinger, who is making the transition from racing into broadcasting, during their breaks from driving. Scott Dixon is an anchor on the GT Le Mans defending winning team from Chip Ganassi Racing, and its sister car won the year before. Now there’s been a balance of performance tweak that has the Ford GTs feeling a tad handcuffed headed into the race.